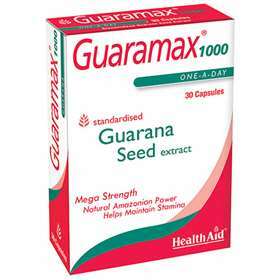 Health Aid Guaramax 1000mg Capsules are packed with energy from 1000mg highly concentrated Guarana seed extract in each capsule, well-known for its natural energising properties. Guarana is natives to the Amazonian Forest and is used to give a natural extra boost of energy for those with a demanding, active lifestyle. For people that lead a active lifestyle. A natural boost of energy. Manufactured to high pharmaceutical standards. Free from: added sugar, salt, GMO, yeast, gluten, wheat, dairy, artificial colours, preservatives and flavourings. Suitable for adults. Take one capsules in the morning upon rising (can be increased to two if required). It is not recommended for extended use. Do exceed the stated dose unless advised by a suitably qualified person. This product contains caffeine. If you are on prescribed medication, or suffering from high blood pressure, seek professional advice before taking this supplement . Soybean Oil, Standardised Guarana seed Extract, Gelatine, Glycerol, Vegetable Shortening, Purified Water, Yellow Beeswax, Lecithin (unbleached),Natural Colours (Titanium Dioxide, Cochenille Red).